We are about to let you in on a little secret that interior designers frequently use to give a space an instant upgrade…lighting! Okay, maybe it was not that much of a secret but lighting is an often overlooked yet crucial detail in the design of any space. 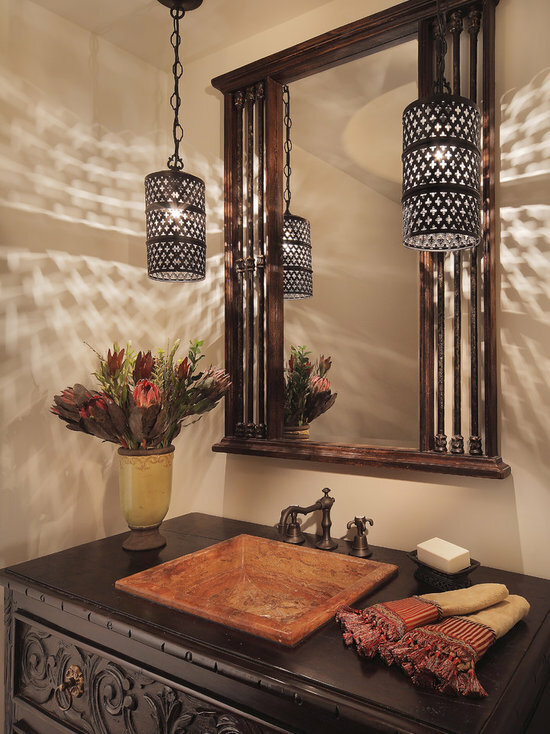 Lighting has the ability to dictate the mood and aid in telling the story behind your decor. It is so easy to become caught up in colors, fabrics, wallcoverings, window treatments, and accessories that your lighting becomes forgotten. Without proper lighting, your carefully curated details will fall flat or simply go unnoticed. Read below to learn lighting basics and some extra tricks on how to use lighting to design a show-stopping space. This may seem so obvious that you may not think it even worth mentioning. However, natural light is often what we attempt to recreate with artificial lights. Taking advantage of the natural light already available will make creating your lighting plan much easier. It is best to exploit the use of natural light in areas that are primarily used during the daytime. To supplement the lack of natural light on cloudy days, use soft lighting from free standing lamps. In rooms used at night or where the windows are typically covered for privacy, place some lights close to the window to help project the natural glow further into the room. 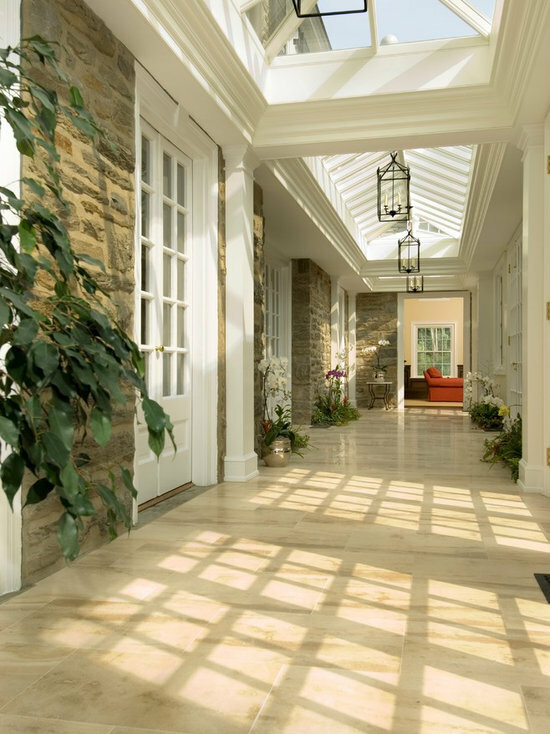 In this hallway, the skylights allow sunlight to flood the space and the hanging light fixtures are used primarily as accents. 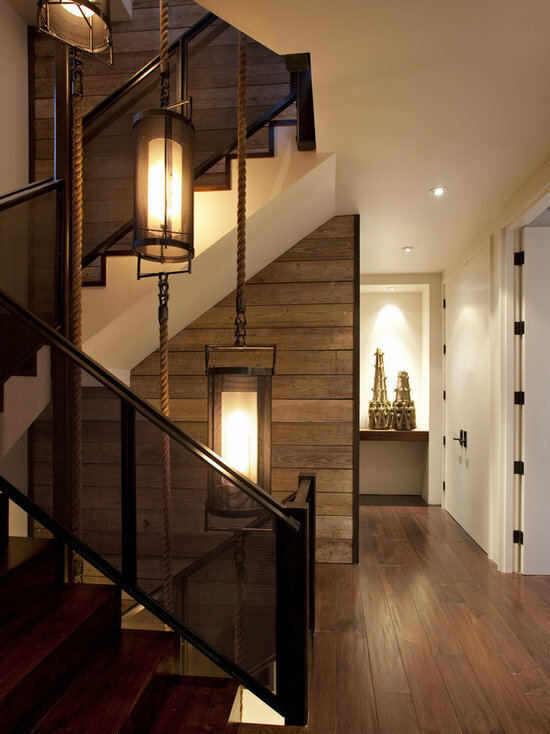 However, in the evenings the position of these light fixtures allows them to replicate the soft glow of natural light. All the best things have layers – your favorite outfit, a delicious dessert, and yes the lighting in your home. Lighting layers should be broken into these three segments: overhead, task, and accent. However, don’t let the word “overhead” fool you, this should really be approached as your primary light source and could be recessed lighting or even your window, depending on the space. Additionally, your task and accent lighting may also come from overhead sources such as a pendant or track lighting. Having lighting in layers helps to create an overall warm glow, provide bright light when needed, and beautifully highlight your accents and architectural features. This penthouse is a great example of the effect many layers of lighting can have on a space. Notice the recessed lighting, uplighting in the recessed ceiling, the flush mount fixture, floor and table lamps, and even the blue glow of a light in the bookshelf. Each of these amplify the design of this room in a unique way. The amount of light given off by your light fixtures is crucial to the design of your space; too much and it can come across as abrasive, too little and your thoughtful work may go unnoticed. Don’t settle for just on or off, installing a dimmer is an inexpensive tool to give you complete control over your lighting. Think of your kitchen, you will want different amounts of light when cooking, eating dinner with the family, or hosting a swanky cocktail party. The dimmers will give your lights the ability to multi-task and can help you save money on your utilities! Also, if you can, consider segmenting your light sources making it easy to turn on and off areas that are not in use giving you more control over the amount of light in the space. In a hallway like this, a dimmer or segmented lighting can help to feature stunning design features, like the multi-story chandelier, or highlight your art collection. Lighting trends seem to change about every 10 years. If changing your lighting every 10 years is not something you are interested in, consider using crystal light fixtures. 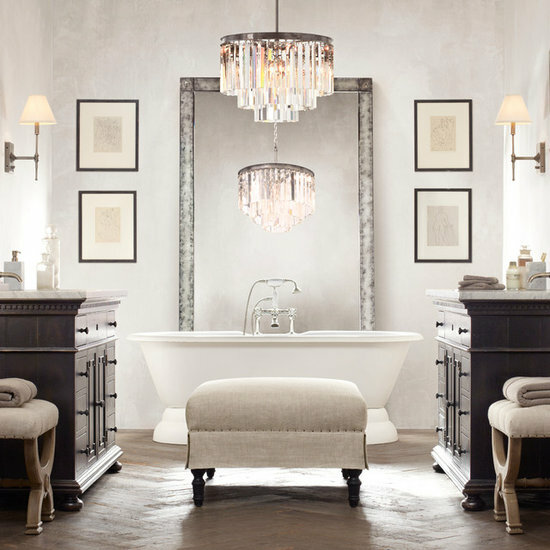 Crystal is a timeless option that fits in seamlessly with many design styles. However, using a variety of styles in the same space makes it easy to change only one or two pieces out when trends or your preferences change. Small changes like this can transform the design of a space quickly and inexpensively. When choosing your light fixtures, mix and match styles and don’t feel that you need to stick to the same design or brand. The orb chandelier in this photo is currently very trendy. There is no doubt that it certainly adds a wow-factor to this simple living space. 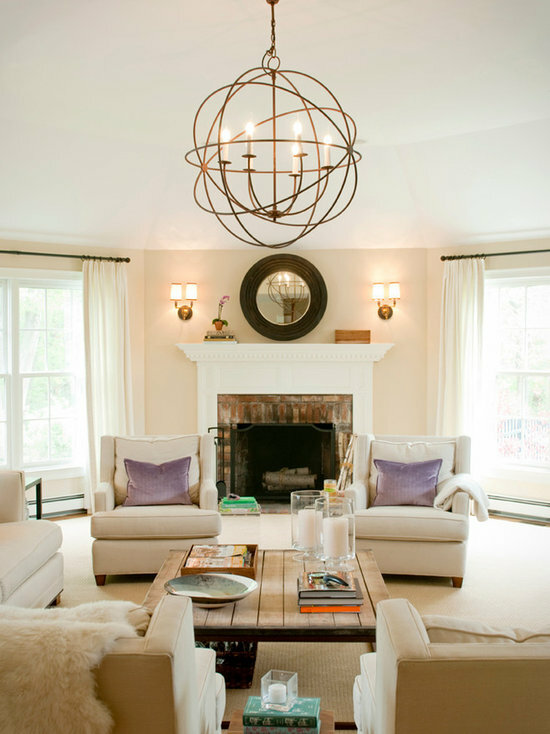 Complemented by an abundance of natural light from the large windows and the simple wall sconces above the fireplace, this chandelier is the focal point of the room. However thanks to the simplicity of the light sources around it, switching this chandelier as trends and tastes change is a quick and easy way to keep the design of this room current and inviting without changing any other detail. Have fun when working with your accent lighting. Up-lighting along a hallway can give the appearance of taller ceilings or colorful toe-kick lighting under your kitchen cabinets can add some fun to a practical space. Also, carefully consider the base of your table or floor lamp. A dramatic base can add to the visual interest in your space while also being a practical and usable piece. 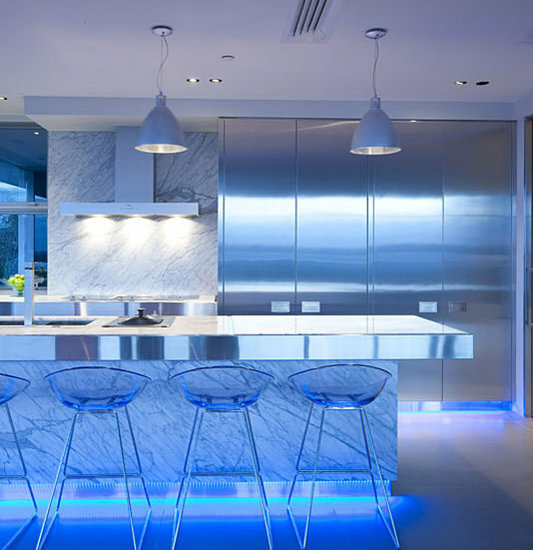 The blue toe-kick lighting in this kitchen is an unexpected detail that ties the design of this modern home together. Not only is this a fun addition to the kitchen but also a practical detail to prevent stubbed toes when looking for a late night glass of water. The overlooked pieces of a design are usually the most important. Lighting is unlikely to be the first thing you notice in a well designed space. However, without it you will immediately feel it’s absence. Installing the right light fixture can often lead to an “ah-ha” moment when the missing piece of a design is finally installed. Don’t let your home design fall flat, schedule an in-home consultation with an interior designer and watch as your space is taken to the next level.